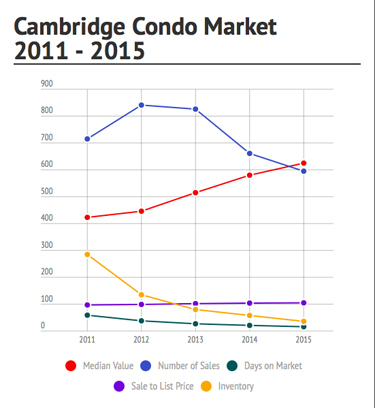 The condominium market in Cambridge and Somerville has seen remarkable changes in the past 5 years. Values have appreciated significantly, market times have declined and inventory is significantly lower. Median value increased an incredible 47.75 % from 2011 - 2015. Appreciation has been driven by a lack of inventory and buyer demand driven by low mortgage interest rates and an improved local economy. The number of sales increased from 715 to 841 from 2011 to 2012. From 2012 to 2015 the number of sales has declined each year falling to 595 sales in 2015. The number of days on market has declined every year from 2011 to 2015. In 2011 the average days on market was 59 days. In 2015 it was 16 days. Sale prices relative to list prices have increased every year from 2011 through 2015. In 2011 the average sale to list price was 97% As inventory decreased dramatically from 2012 through 2015 many condo listings attracted multiple and over asking price offers. This has driven the sale to list price ratio up to 105% in 2015. We measured inventory on April 30 of each year. The number of condo listing on the market has declined dramatically from 2011 through 2015. On April 30, 2011 there were 285 condos on the market. In April 30, 2015 there were only 36 condos on the market. The condominium market has been in an appreciating cycle during the 5 year analysis period. The current market is a seller's market with historically low inventory levels. Demand is exceeding supply with multiple offers significantly over asking price occurring frequently. The number of sales increased from 352 in 2011 to a peak of 475 in 2013. From 2013 to 2015 the number of sales has declined each year falling to 407 sales in 2015. The number of days on market declined from 2011 to 2014. In 2015 days on market increased by 1 day from 19 to 20. In 2011 the average days on market was 62 days. In 2015 it was 20 days. Sale prices relative to list prices have increased every year from 2011 through 2015. In 2011 the average sale to list price was 98% As inventory decreased dramatically from 2012 through 2015 many condo listings attracted multiple and over asking price offers. This has driven the sale to list price ratio up to 104% in 2015. We measured inventory on April 30 of each year. The number of condo listing on the market has declined dramatically from 2011 through 2015. On April 30, 2011 there were 147 condos on the market. In April 30, 2015 there were only 39 condos on the market. 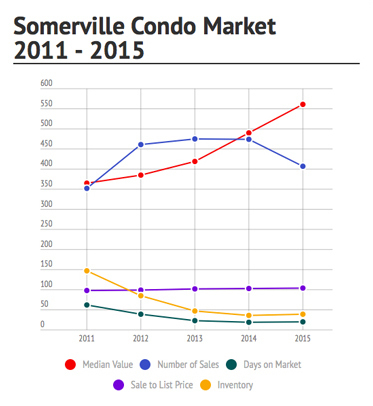 As in Cambridge, the Somerville condominium market has been in an appreciating cycle during the 5 year analysis period. The current market is a seller's market with historically low inventory levels. Demand is exceeding supply with multiple offers significantly over asking price occurring frequently.